Throughout the year, many Colorado towns aim their searchlights at the sky and welcome in a special crowd — film gurus from across the globe. Colorado film festivals seem to grow in number every year. Below are a few of the most popular Colorado film festivals. In the historic, beloved Boulder Theater — where dancing, drinking, eating and watching movies are all acceptable behaviors — the Boulder International Film Festival has earned the reputation as one of the most influential young film festivals in the country. The event invites international filmmakers to show their work for an audience full of aspiring filmmakers. While the event hosts academics, directors, writers, actors, producers and the like, a large part of the festival's goal is to inspire film hopefuls, so that one day they can see their creative dreams projected onto the big screen. If you're a fan of boldly independent cinema, make sure to catch one of the well-hyped Boulder screenings. The southwest Colorado town of Durango has also gotten some indie cred lately with its festival, which has been held since 2001. Held during the spring, when some of the sunniest and warmest skiing can be had at Purgatory, this film festival lures lovers of both pastimes each year. Many of the festival's events are held at the Durango Arts Center and galleries, where bands (indie ones, of course!) play live music, parties are held and other artsy events happen. With a subtitle of "Inspiring Adventure," you know this Carbondale fest's films will leave you with a dropped jaw at least once. But don't expect run-of-the-mill ski shots. Organizers sum it up with this statement: "We avoid films solely about hucking yourself off a cliff and love films with a story and a human element." So there you have it: adventure films that might make your wipe a tear or expel a bit of laughter. 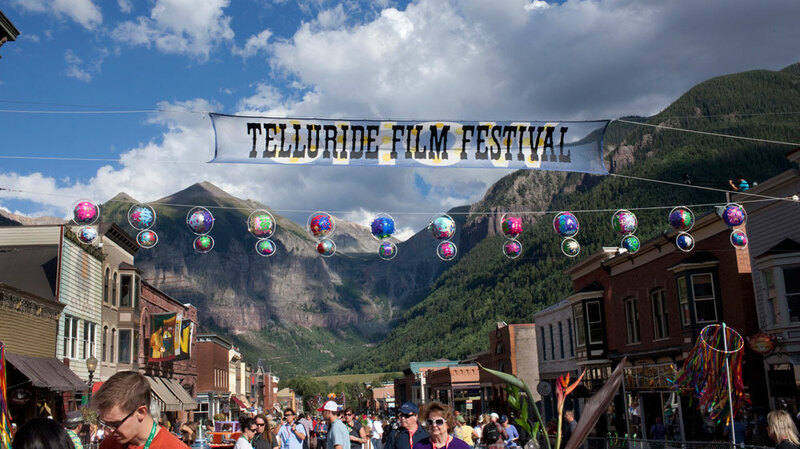 In the depths of the San Juan Mountains and snuggled between two impressive peaks, the Telluride Film Festival is a destination event with an arresting backdrop. A Labor Day weekend ritual, the festival has inspired guest directors like Peter Sellers ("The Pink Panther") and Peter Bogdanovich ("The Sopranos") to make the trek to this southwestern gem. Telluride is known for its exciting and laid-back ambiance, the audience’s good humor, appreciative guests, mouthwatering food and scintillating film discussion. For movie history buffs, it is also the first place that "My Dinner With Andre," "The Civil War," "Twin Peaks" and "The Crying Game" were ever viewed. Running strong for 37 years, Breck's fest is one of the country's oldest. Hosted of late by film critic Jeffrey Lyons, the more than 51 films screened focus on shorts, independent dramas, comedies and documentaries. The fest's association with the Film Studies Program at the University of Colorado - Boulder ensures there are always fresh voices involved; and for the past eight years, the festival has hosted a overcoming adversity/spiritual-themed film series within the main program, which showcases works intended to spark meaningful discussion. This is the film fest of royalty. Keeping in sync with Aspen’s tradition of big names and big fur, this festival includes major productions, Oscar hopefuls and lavish benefit dinners. But perhaps the most impressive piece to this festival is the variety of genius that can be seen at any of the participating theaters. The festival’s premise of “taking a chance to be taken somewhere new and unexpected,” speaks to the in-depth documentary films and shorts — but also to the town itself. Aspen is like no place you’ve ever been, where Prada opens its doors next to REI, designer dogs run in fields of rugby players and world-renowned art galleries are visited by fully garbed skiers. Another film mainstay, Denver's largest film festival (previously called the Starz Denver Film Festival) is in its 41st year and has grown to 12 days in duration. With a little more glitz than some of the mountain events, Denver hosts red-carpet premieres and films from dozens of countries and more than 250 filmmakers. Attracting nearly 55,000 film aficionados annually, SDFF is lauded for presenting Academy Award- and Independent Spirit Award-winning films, including “Black Swan,” “Silver Linings Playbook” and "Lady Bird." Photo courtesy of the Telluride Film Festival.